I found this great article (where I shamelessly stole the image to the left from) it has a lot of stress testing on different alkalines and they threw in some rechargables. 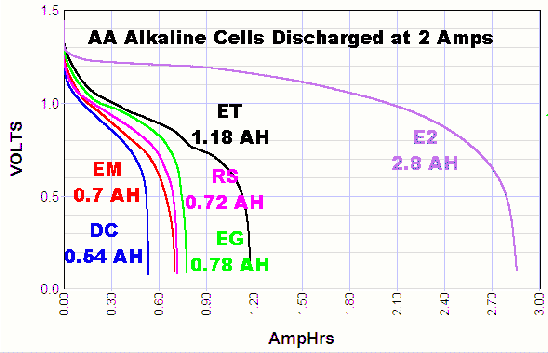 You can clearly see by the graph that most alkalines are going to buckle real fast when you try to draw 2 amps from them. This makes sense because when I was using the alkalines the result was much worse than the bench power supply (which current limits shortly after 3A). If you look further down he does this test on some NIMH cells and he was able to get 5A out of it without too much voltage drop. This is clearly the explanation why the alkalines were so horrible. So I got a few different power options coming. I got some cheap buck regulators from fleabay and some cells coming. Hopefully it’s sufficient to at least run through the demo software properly!